The cornea plays a key role in vision as it provides about 80% of the power to focus light in the eye. On this important structure is a thin film of tears which needs to be of a specific chemical composition and thickness to provide consistent vision. If this balance is not optimal it is termed dry eye. Dry eye can be caused by the normal aging process, hormonal changes, environmental conditions like wind and computer use, complication from medications like antihistamines, oral contraceptives and antidepressants. The common symptoms of dry eye include stinging, gritty, scratchy and uncomfortable eyes, fluctuating vision and sometimes having a burning feeling within the eye. Some people will experience excessive tearing as a result of dry eye as this is the natural reflex when irritation is noted. During the examination the optometrist will assess your risk for dry eye from your general health history, medication usage, high-powered microscopic examination with special dyes and sometimes eye lid expression. Additional tests can be performed on referral to quantify the tears and take specialized pictures of the tear film. 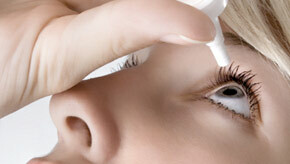 Dry eye is usually a chronic condition which is managed through the use of artificial tears. In some cases warm compresses, supplements containing Omega-3, gels and ointments, punctal plugs and directed heat therapy may be required depending on the severity. There a new prescription medications that may also be useful in managing difficult cases. Dry eye can be harmful to the eye if left untreated over an extended period of time due to corneal damage and scarring. Contact lens patient may find increased difficulty with vision and reduced wearing time as well. To keep dry eye symptoms in check it takes a good relationship between the patient and optometrist to constantly adjust the treatment and maintain consistently clear vision.